Brian Hall (’96) may not be a movie star, but the computer software he helped to develop has quickly become one — reaching such heights that it has earned the Biola graduate one of film’s most prestigious honors: an Academy Award. 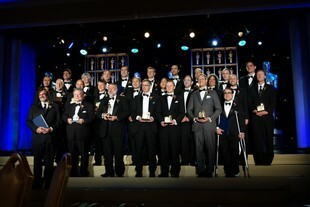 This year, one of nine Scientific and Technical Achievement Academy Awards will go to Hall and his two colleagues at Sony Pictures Imageworks for the creation of Katana, an industry-changing software that has played an important role in such films as The Amazing Spider-Man and Oz the Great and Powerful. 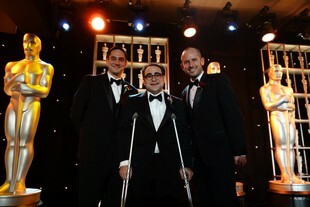 The awards will be presented on Feb. 9 in a ceremony at the Beverly Hills Hotel. Portions of the presentation will be aired during the Oscar telecast on Feb. 24. Hall, a graduate of Biola’s computer science department, spent the last eight years developing the new program with his co-workers. Hall is the first alumnus in Biola's history to receive an Academy Award. He took some time to share his eight-year journey in developing Katana with Biola. Watch Brian Hall and his colleagues receive their Scientific and Technical Achievement Academy Award (select video titled "Steve LaVietes, Brian Hall and Jeremy Selan accept Technical Achievement Awards" in video player menu). 1. A computer science degree in '96 must have looked different than it does today. How has the world of computer science changed since you've been working in the industry? The biggest change affecting computer graphics has been the amazing increases in computing speed and memory. Workstations now are hundreds of times faster and have a hundred times more memory. In 1996, graphics cards were much less powerful than the graphics chip in your iPhone and were only available on workstations that cost tens or hundreds of thousands of dollars. So you'd think that our job has gotten really easy with all this computing power. However, the complexity and realism that we want to put into our visual effects has risen as well. It is now common to have scenes with computer-generated characters in a computer-generated city, with amazing detail, down to air conditioning units on buildings and cars, crowds, and street lamps on the ground. So it's an ongoing challenge for us to write software tools to take advantage of the latest advances in hardware. 2. Was it your goal to work in the film industry? I didn't plan on working in the film industry specifically, but knew I wanted to do something related to graphics or interactive software. I had dabbled with writing some (very cheesy) video games in junior high. At Biola, I took a computer graphics class with Dr. Peter Woo that really sparked my interest in graphics. In my junior year at Biola, I met Rob Bredow, the current CTO at Sony Pictures Imageworks, as a fellow student, in a Bible course of all places. We got to talking after class about his work in visual effects for some TV shows, and that summer he brought me on as an intern at the small visual effects company where he worked. That's the short story of how I got into this field. 3. In layperson's terms, what does Katana do and how has it advanced the film industry? In both visual effects and animation, we are striving to make our images appear realistic. This requires us to have visual complexity similar to that of the real world. For example, in the recent The Amazing Spider-Man, when Spider-Man is swinging through the streets of New York, entire sequences including the buildings, lights, cars, crowds and Spider-Man himself are computer rendered. Katana is a software tool that artists use to manage and art direct all this complexity. The core concept in Katana is that we allow artists to make changes at any level of the scene without requiring them to work with all of that complexity at once, which would be an overwhelming task both for the artist and the computer. Katana allows the artist to efficiently work in broad strokes (e.g. change the overall lighting) or with small details (e.g. change the amount of dirt on a single air conditioning unit). Katana also helps artists share common standards, both to ensure consistency and to avoid reinventing the wheel for every shot. The end result is more flexibility for film directors and better looking final images. 4. How did your time at Biola influence how you've approached your career? In addition to a solid education in computer science, the time spent together with other computer science majors and professors was invaluable. We shared a common area ("the alcove"), where we could bounce ideas off each other as we worked on programming assignments, help maintain student servers, and have some friendly competitions (writing artificial intelligence programs to compete against each other at Othello, for instance). This camaraderie extended to the dorms (many of us lived in Sigma) where some of the guys built networks for us to play Bolo and Doom against each other. The world wide web was just starting to take off as most of my class was graduating in the mid-90s. A couple friends took it upon themselves to set up a "Server O' Companions" that we still use to keep in touch today. Many of us are now working as programmers, network engineers, web developers, music video producers, pastors, and as a technology missionary in Papua New Guinea. It's so great to have this wealth of experience to rely on from friends now scattered all over the world, based on a few years that we spent together at Biola. 5. What was it like working on Katana? What did day in and day out look like the past few years? From the beginning, the development was done by a small team of programmers with a lot of collaboration and feedback from artists using the Katana on real shots even in its early form in 2004. We would release a new build of Katana every week and meet weekly with the "Katana Town Council," a group of lighting artists, to talk about new features and fixes and find out what was or was not working well for them. The goal was always to get images rendered in an efficient way (both in terms of computer time and artist time), and the constant feedback helped us develop lots of efficient workflows within Katana along the way. Imageworks formed a technology-sharing agreement in 2009 with The Foundry, a company based in London that specializes in developing commercial visual effects software. So in addition to working with our in-house artists, we also now get to work alongside The Foundry team to help get Katana into the hands of artists at many studios worldwide. 6. Did you reach a breakthrough at some point where you knew this tool would be extremely helpful and gain recognition? Early on, our aim was to test an early version of Katana on a small sequence of test shots. As word began to spread within the company about what we were building, we quickly had three large shows (Spider-Man 3, Surf's Up, and Beowulf) all wanting to use Katana as the lighting tool for their show. Although this was a bit scary for us at the time, it was a good indication that we were heading down the right path. More recently, as we worked with The Foundry to make Katana available commercially, we had early interest from some large, well-known studios such as Industrial Light and Magic (ILM) and The Moving Picture Company (MPC). This was good confirmation for us that Katana was more than just a one-studio tool. Learn more about Biola's Computer Science and Cinema and Media Arts programs.